William Bradford (1590-1657) was a founder and longtime governor of the Plymouth Colony settlement. Born in England, he migrated with the Separatist congregation to the Netherlands as a teenager. Bradford was among the passengers on the Mayflower’s trans-Atlantic journey, and he signed the Mayflower Compact upon arriving in Massachusetts in 1620. As Plymouth Colony governor for more than thirty years, Bradford helped draft its legal code and facilitated a community centered on private subsistence agriculture and religious tolerance. Around 1630, he began to compile his two-volume “Of Plymouth Plantation,” one of the most important early chronicles of the settlement of New England. Born of substantial yeomen in Yorkshire, England, Bradford expressed his nonconformist religious sensibilities in his early teens and joined the famed Separatist church in Scrooby at the age of seventeen. 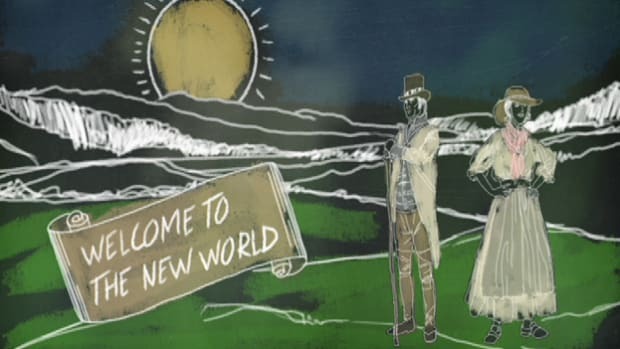 In 1609 he immigrated with the congregation, led by John Robinson, to the Netherlands. 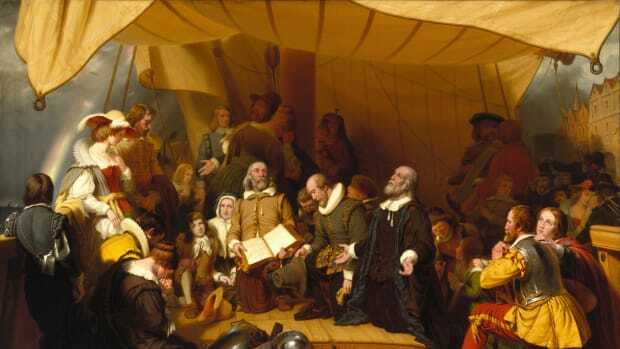 For the next eleven years he and his fellow religious dissenters lived in Leyden until their fear of assimilation into Dutch culture prompted them to embark on the Mayflower for the voyage to North America. Did you know? 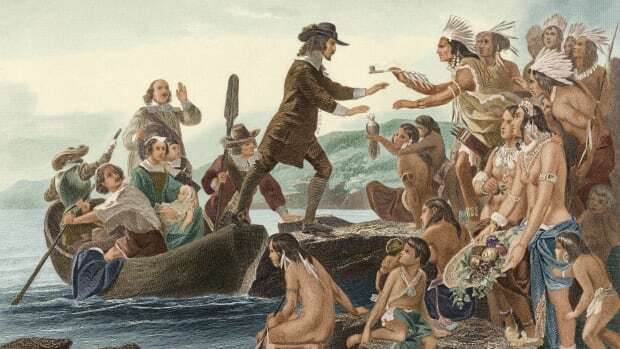 William Bradford&apos;s descendants include Noah Webster, Julia Child and Supreme Court Justice William Rehnquist. 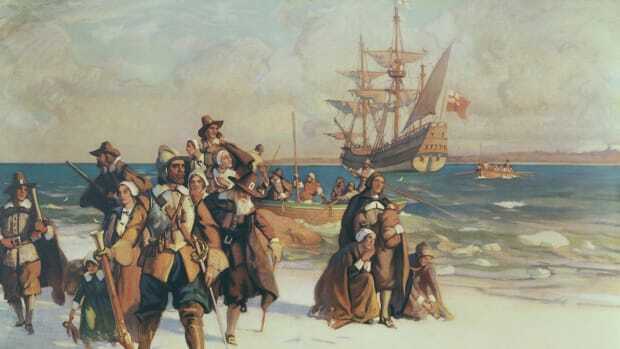 The Pilgrims arrived in what became Plymouth, Massachusetts, in 1621 with a large number of non-Separatist settlers. 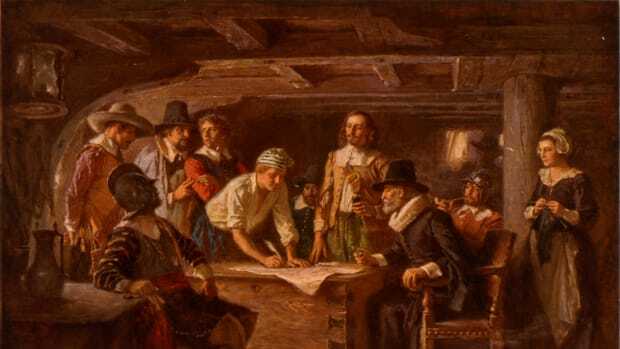 Before disembarking, the congregation drew up the first New World social contract, the Mayflower Compact, which all the male settlers signed. Bradford served thirty one-year terms as governor of the fledgling colony between 1622 and 1656. 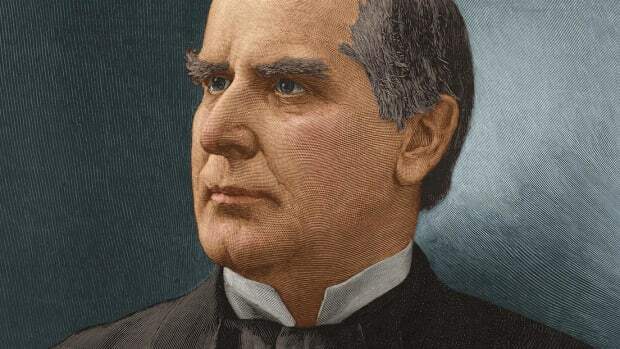 He enjoyed remarkable discretionary powers as chief magistrate, acting as high judge and treasurer as well as presiding over the deliberations of the General Court, the legislature of the community. 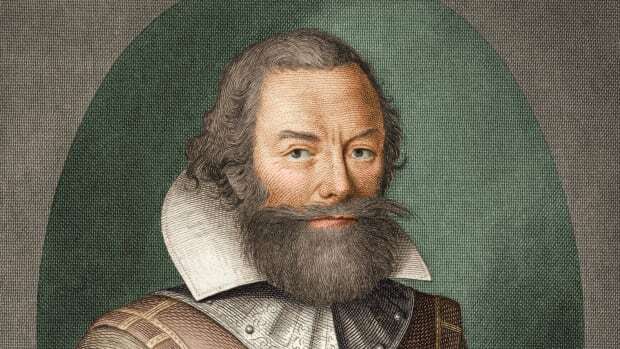 In 1636 he helped draft the colony’s legal code. 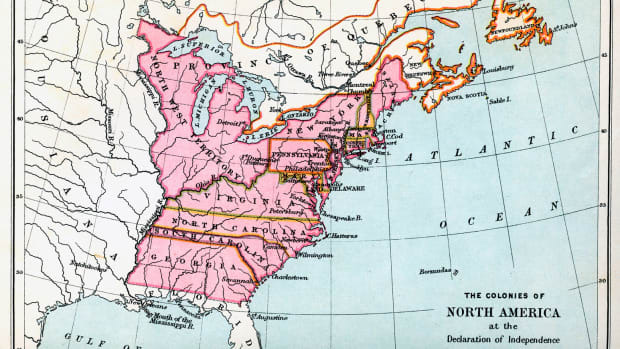 Under his guidance Plymouth never became a Bible commonwealth like its larger and more influential neighbor, the Massachusetts Bay Colony. Relatively tolerant of dissent, the Plymouth settlers did not restrict the franchise or other civic privileges to church members. 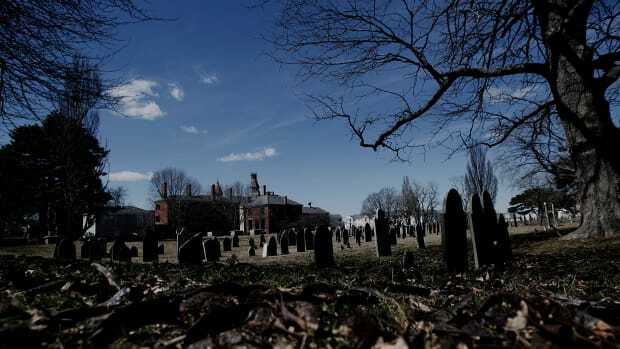 The Plymouth churches were overwhelmingly Congregationalist and Separatist in form, but Presbyterians like William Vassal and renegades like Roger Williams resided in the colony without being pressured to conform to the majority’s religious convictions. After a brief experiment with the “common course,” a sort of primitive agrarian communism, the colony quickly centered around private subsistence agriculture. This was facilitated by Bradford’s decision to distribute land among all the settlers, not just members of the company. 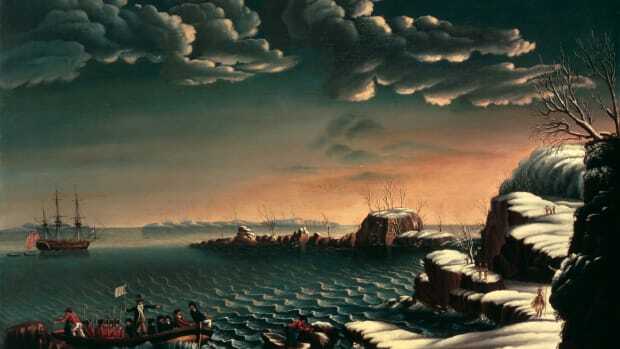 In 1627 he and four others assumed the colony’s debt to the merchant adventurers who had helped finance their immigration in return for a monopoly of the fur trading and fishing industries. Owing to some malfeasance on the part of their English mercantile factors and the decline of the fur trade, Bradford and his colleagues were unable to retire this debt until 1648, and then only at great personal expense. Around 1630 Bradford began to compile his two-volume Of Plymouth Plantation, 1620-1647, one of the most important early chronicles of the settlement of New England. Bradford’s history was singular in its tendency to separate religious from secular concerns. Unlike similar tracts from orthodox Massachusetts Bay, Bradford did not interpret temporal affairs as the inevitable unfolding of God’s providential plan. 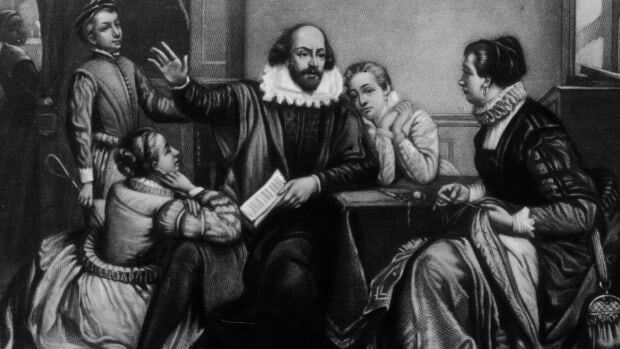 Lacking the dogmatic temper and religious enthusiasm of the Puritans of the Great Migration, Bradford steered a middle course for Plymouth Colony between the Holy Commonwealth of Massachusetts and the tolerant secular community of Rhode Island.